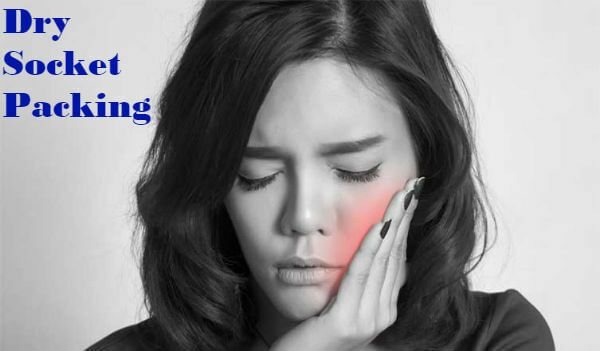 There are two types of dry socket packing—medicated gauze or cotton that you need to replace every day and hemostatic packs which dissolve on their own within two to five days. Dentists put these packs in the extraction site to stabilize the clot and to prevent a painful dental condition called, “dry socket”. A dry socket or alveolar osteitis could develop after tooth extraction and could last up to ten days. It is characterized by severe pain in the extraction site that radiates to the ear, within 2 to 5 days after an adult tooth was pulled out. If you are at risk of developing this condition, your dentist might recommend medicated carriers which stays in place from 24 to 48 hours. For those who are experiencing a high level of pain, the pack has to be replaced every 24 hours or at least every two days for up to a week. What is a Dry Socket Packing? Why Do You Need Packing? After washing away loose debris from your extraction site with saline solution or sterile water, the dentist will dry the socket gently with suction. The purpose is to prevent bacterial formation and to remove anything that might interrupt with the natural healing process of your gums. Afterward, the dentist will make a ‘packing’ by smearing a medicated paste onto a piece of gauze or cotton. The dentist will then place the medicated carrier directly into your tooth socket. The above-mentioned anti-bleeding packing usually liquefies in three to five days after the dentists place them on bleeding tissues. Bleeding control. Ordinary medicated gauzes or cotton balls and sterile medicated carriers like Gelfoam, Surgicel and Surgifoam aid in the cessation of bleeding, also known as hemostasis. Pain relief: Packings immediately relieve some pain. However, it is important to follow the instructions provided by your dentist especially when it comes to cleaning and replacing of gauze at home to avoid infections and injury in the socket. Speedy healing. A person with this condition is at risk of delayed healing and infections. So, it is important to call your doctor immediately when you experience fever and chills, redness or swelling of the socket or gums. It is also important to watch out for pus or discharge from the area of tooth extraction. Not everyone develops this painful condition, but some people are more at risk than the others because of the following reasons. Are you experiencing pain that feels like it covers one side of your face or mouth, extra sensitivity to hot or cold drinks? Those are typical symptthe oms of dry socket! Call your dentist to know what steps to make to avoid further complications. How To Tell If You Have A Dry Socket? Hi I developed a dry socket after having a wisdom tooth pulled and the dentist flushed the area,painful,then shoved a gauze soaked in clove oil into the huge gap.this was done 3 days ago and unlike other clove gauzes I’ve had that just fall out this one is firmly, very firmly,stuck in place.should I be pulling it out soon? I just hady dry socket packed almost 5hrs ago and he also stitched it in place well the stitches and the packing has totally came out, is it to early for it to come out? I thought it was suppose to at least stay 24hrs, since it came out the severe pain is beginning to start back should I contact the dentist or just let it be? ?